The perfect way to convert from SD and HD-SDI to analog component, s-video or NTSC/PAL composite. Mini Converter SDI to analog supports all SD and HD input formats up to 1080p60 and includes a down converter for when you need to convert from HD to standard definition analog formats such as s-video and composite. Audio can be de-embedded to balanced analog or AES/EBU. Mini Converter SDI to Analog is ideal for converting to older analog equipment when you don’t need the extra cost of the 6G-SDI 4K model. Blackmagic Design’s SDI to Analogue Mini Converter is one of the world’s most sophisticated converters thanks to its use of the latest 6G-SDI technology. Capable of automatically sensing the input video format and instinctively changing between essentially all SD, HD and Ultra HD video standards up to 2160p30. The SDI to Analogue Mini Converter utilises advanced features such as redundant SDI inputs, re-clocked loop outputs, and full analogue and AES/EBU audio connections so you can convert video, as well as embed or de-embed audio. 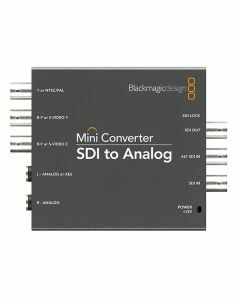 The Blackmagic Design SDI to Analogue Mini Converter uses a simple, condensed design that means it’s easy to use and incredibly dependable when used as part of a 24/7 operation. The built-in connections are quick to access and utilise standard cables, as well as the built-in mini switches which can be used to swiftly change settings. There’s even a diagram with switch settings printed on the back – you’ll never have to look for the manual. The SDI to Analogue Mini Converter is the ideal way to convert from SD and HD-SDI to analogue component, s-video or NTSC/PAL composite. Capable of supporting all SD and HD input formats up to 1080p60 (including a down converter for converting from HD to standard definition analogue formats such as s-video and composite), audio can be de-embedded to balanced analogue or AES/EBU. When you don’t need the extra cost of the 6G-SDI 4K model, the Mini Converter SDI to Analogue is ideal for converting to older analogue equipment. NTSC, PAL, S-Video and component SD/HD from 3G-SDI input. Auto detection of SD, HD, 2K or 3G-SDI. SD Format Support: 525/23.98 NTSC, 525/29.97 NTSC. 625/25 PAL. HD Format Support: 720p50, 720p59.94, 720p60, 1080i50, 1080i59.94, 1080i60, 1080p23.98, 1080PsF23.98, 1080p24, 1080PsF24, 1080p25, 1080PsF25, 1080p29.97, 1080PsF29.97, 1080p30, 1080PsF30, 1080p50, 1080p59.94, 1080p60. SDI Compliance: SMPTE 292M, SMPTE 259M, SMPTE 296M, SMPTE 372M, SMPTE 424M­â€B, SMPTE 425M, ITUâ€R BT.656 and ITU­â€R BT.601. SDI Video Rates: SDI video connections are switchable between SD, HD, and DCI 2K. SDI Auto Switching: Auto detection of SD, HD or 3G-SDI. Analog Format Support: 625/25 PAL, 525/23.98 NTSC, 525/29.97 NTSC. 720p50, 720p59.94, 720p60, 1080i50, 1080i59.94, 1080i60, 1080p23.98, 1080p24, 1080p25, 1080p29.97, 1080p30, 1080p50, 1080p59.94, 1080p60.